My son received a clean bill of health from his Dr. and is all set to go back to school on Thursday!!!! I had no doubt that she would give the OK for him but it was nice talking with her and seeing her delight in how good he looks. Lil' Reg is sooo ready to get back to being a teenager after being stuck in this house since Oct. 21st and I'm so thankful that he's healthy once again!!! Here's what we'll be creating today and I hope everyone enjoys making these projects. Not the one I had planned for today but I'm thinking it'll do!! My fave is the card because I used my SU! markers and the Big Shot---2 of my favorite things! The calendar was supposed to have magnets attached but I can't find them now that I've cleared most of my things out....should've just left it messy LOL!! It gave me a chance to use up a few more clips though so I'm happy about that. The post it note holder can serve a dual purpose if you want it to....I almost--key word--put a cello bag in there with some candy until I realized I didn't have any candy to pass out *gasp* so it's now *officially* a post it note holder!!! Before I jet off of here, there's some blog candy up for grabs over on Lauren's blog. The stamped images are darling and would be too cute all colored in!! Hop on over & post a comment and if you win, we split the images K?!! JK!!!! Thanks so much for stopping by and have a great rest of the day. I'm so happy to hear that your son is better. The projects are wonderful. I so glad that DS is better & can get back to "the real world". Great projects. They are just fabulous. FYI: You're my 1st stop in the a.m. (after checking my emails, of course). You definitely brighten my day! Love your cards and projects, Jackie! So glad your son is well and back to school. I know how relieved you are! Your creations are always so wonderful! Glad to hear all went well with the dr.
Jackie, your stuff is always so beautiful! I loved receiving things you made when you were my big sis! Adding you to my subscriptions so I can see what you are up to! This is a really cute gift idea!! Thanks for sharing. Thanks for your comment on my blog. Wonderful looking projects! Glad to hear that your son is well. I really like your work, the colors looks great together! Hi Jackie! First time visitor from SCS! I am not up to speed on what has been going on with your son, but I am glad that he is back on his feet, and life is resuming as scheduled for you all! I have to say, I love all of your projects! They are gorgeous! Congrats on the clean bill of health. I can come over and help mess things up so you can find your magnets ;) LOL! Love these projects. Great colors and love how you used the Top Note die. I just got mine and LOVE IT! You have inspired me to try something else with it. Have a great day! Good to hear your son is better! Glad to hear it is also a Healthy New Year. Jackie, I just love the pretty projects you created. Love them all! These are great projects. I love that Valentine bundle set. Can't wait till it's available again. Glad your son is better. I love what you did with the top note die! I just may have to break down and buy it. This is a beautiful gift set. Glad your DS is better. 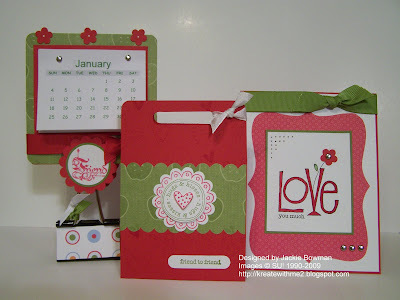 Your projects are so pretty...love the calendar and glad your son is better! Love all of them, so very nice! Glad your son is a-okay now...my daughter has shingles now...in her ear, its her second battle with them, so very painful! These are so adorable! Great job on all of them! Lovely cards! I love the colors! The love card is great!